Production will be limited to just ten units. Last week, renowned Porsche tuner TechArt teased that it has something special in store for the Geneva Motor Show next month. With just over a week until the show starts, TechArt is now ready to reveal what it's been cooking up: say hello to the GTStreet RS. Based on a Porsche 911 Turbo S, production will be limited to only ten units. 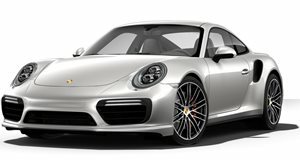 While the standard 911 Turbo S is powered by a 3.8-liter twin-turbocharged flat-six engine that produces 580 hp and 553 lb-ft of torque, TechArt has increased the output to 770 hp and 678 lb-ft of torque. This is possible thanks to TechArt’s GTstreet RS Powerkit, which adds a newly developed VTG turbocharger. With Sport Plus mode activated, 0-62 mph now takes just 2.5 seconds before the GTStreet tops out at an electronically limited 211 mph. This can be increased to 224 mph when driven on a high-speed testing ground and equipped with specially homologated sports tires. TechArt hasn’t just added 140 more horses and called it a day, however. On the outside, the tuner has added a carbon fiber body kit that includes a front apron with a carbon front spoiler and active front spoiler lip to optimize the airflow. The integrated headlights are framed by striking carbon airframes, while laterally positioned flaps provide additional downforce. Each GTstreet RS also gets a unique carbon hood with the edition number lacquered in high gloss clear paint. The GTStreet RS rides on 20-inch forged wheels wrapped in sport performance tires and the chassis can be upgraded with a coilover suspension and a lift kit that provides an extra 2.3 inches of ground clearance at the front axle. Rounding off the exterior enhancements are new front fenders, side skirts, and air intakes all made of carbon fiber, along with a prominent rear diffuser and an active rear wing that extends and adjusts by 15 degrees in performance mode. The exhaust system also features four centrally located titanium tailpipes. Inside, the GTStreet RS features a sport steering wheel, sport seats, six-point racing seatbelts, a roll bar and color-matched door opener looms. The floor mats, dashboard, center tunnel, center console, sun visors, door pillars, and the roof lining are covered with Alcantara, while the door panels and seats are covered in a combination of leather, Alcantara and virgin wool.